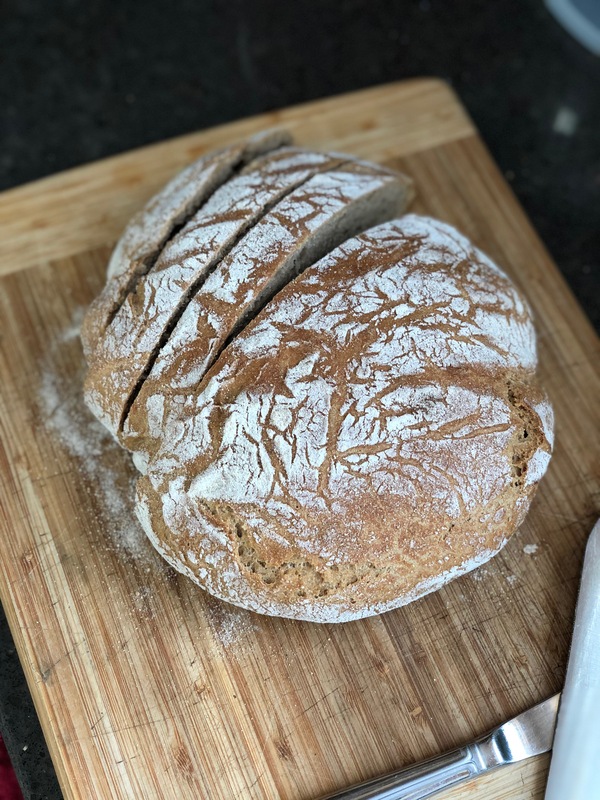 It’s been 7 years since I’ve blogged one of my “Wonderful Wife Tips” because it was about that long ago when I became a mom, so I’ve been more focused on “mom hacks” than “wife tips”!…..but I shared a pic of my crusty bread the other day on Instagram and with a few requests for the recipe, here I am back at it. This is a recipe I found on Pinterest a few years ago (because moms bake bread, right?…I mean, mine did!). But seriously, this recipe is easy and you can add “stuff” to it like rosemary or cheese or whatever else ya like to add to savory breads. I usually put the recipe together the afternoon or evening before I want to bake it because it takes 12-18 hours to rise. In a large mixing bowl, mix all dry ingredients and add water. Cover with plastic wrap and let sit on the counter for 12-18 hours. Heat oven to 450º F. When oven reaches 450º, put a cast iron pot with lid* into the over & head for 30 minutes. Meanwhile, pour the dough onto a heavily floured surface and shape into a ball. Cover with plastic wrap and let sit while pan heats. Drop dough in hot pot. Cook for 30 minutes with the lid on. After 30 minutes my bread is usually done, but if you’d like it to bet a bit more brown and crusty, you can put back in the oven without the lid for 5-10 minutes. *I use a Le Creuset casserole dish with a lid. Check out my first Wonderful Wife post here to see how this got started back in March 2010! It’s a super easy soup recipe so you’ll have something to dip the bread in!